Life on a drum corps tour isn't always glitz and glamour. The Cavaliers' assistant drum major, Jordan Thomas, explains what it is like when tour buses break down. 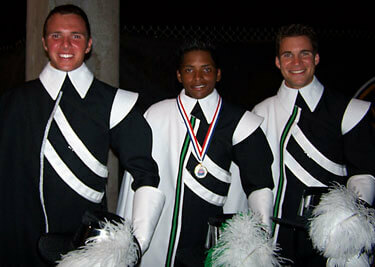 Jordan Thomas (far right) poses with drum major Tommy Allen (center) and guard sergeant Brady Sanders. This interview was taken following the Madison Scouts' performance at the 2006 DCI Columbia event in Columbia, Mo., on June 24. More interviews like this are available exclusively to members of the DCI Season Pass. Learn more about becoming a member of the DCI Season Pass.